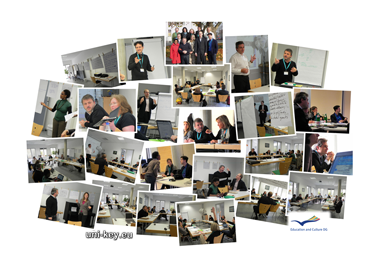 Ten Universities, research organisations, chambers, enterprises and enterprise associations from Belgium, Denmark, Germany, Greece, Italy, Portual, Spain and South Africa collaborate in Uni-Key to develop entrepreneurial skills among mobile students. Very good. to read, easy to understand. Enjoyable! this course is amazing and this is really clear from the first module. like this module Every time, no matter what we do, we need costs and a good plan is necessary! I think excellent idea in each module also to include videos. This project (Uni-Key - Turning European placements into a learning environment for entrepreneurial skills – as a key competence of graduates of European universities, Grant Agreement No 2011 – 3936 / 001 – 001) has been funded with support from the European Commission. This website reflects the views only of the author, and the Commission cannot be held responsible for any use which may be made of the information contained therein.